Mayor proposes extending Circulator Purple Route to 33rd St. Above: The city wants to extend the free Charm City Circulator north. One of the newsier nuggets in the mayor’s State of the City speech this afternoon, the Purple Line extension suggestion comes a-year-and-half after the debut of the north-south route for the city’s free bus service. In November, the city added a Circulator Green Route, making stops at parking areas downtown near Guilford Ave. and the Fallsway, as well as City Hall, Fells Point and Johns Hopkins Hospital. North Baltimore residents and their representative, Councilwoman Mary Pat Clarke, have been pressing for free Circulator service to include Hopkins and Charles Village. Whenever it starts rolling (Rawlings-Blake didn’t say), the Purple Line’s Route will roughly duplicate the notoriously off-schedule Maryland Transit Administration (MTA) No. 3 bus. That’s the city’s other public bus system, for which riders must pay a fare of $1.60 one way. Riders report long intervals where no No. 3 bus appears, and then two or more show up bunched-together. Unlike the Circulator buses, the MTA buses serve all parts of the city, including those not frequented by large numbers of tourists, students or affluent residents. The mayor’s current budget proposal includes $8 million for the Circulator bus system, which is subsidized by parking garage fees. 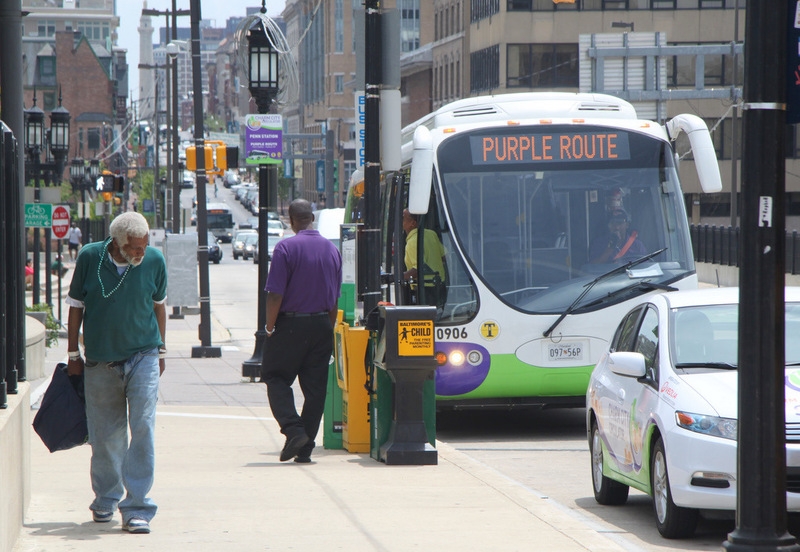 There was no dollar figure attached to the mayor’s proposed Purple route extension. Finding funding for a Purple Line extension to Charles Village may be easier said than done, this report from South Baltimore suggests. Total Purple Line ridership in December, was 132,347, according to the Circulator website, with average daily ridership 4,412. For comparison, their east-west Orange Line, which connects Hollins Market to Harbor East and Little Italy, had 104,706 riders in December, an average daily ridership of 3,490 passengers. MTA, which operates a heavy rail, light rail and MARC commuter service in addition to Baltimore buses, reported average daily weekday ridership of 359,705 in 2009.